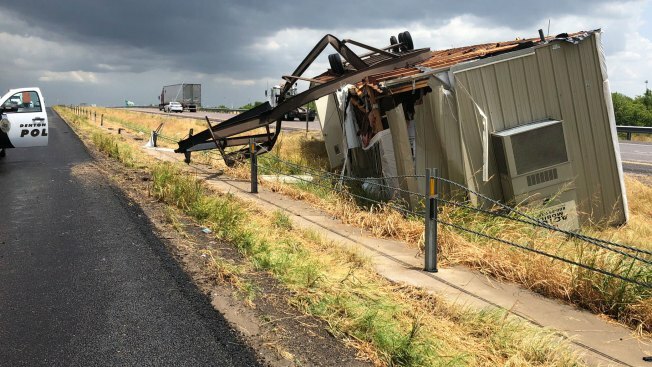 A strong gust of wind is blamed for overturning a trailer along Interstate 35W south of Denton, July 12, 2018. Interstate 35W south of Denton is back open after high winds overturned a portable trailer Thursday afternoon. The portable building was being pulled by an big-rig when a wind gust flipped it over and into the northbound lanes, Denton police spokesman Bryan Cose told the Denton Record-Chronicle. Denton police said no injuries were reported. The incident took place about a half-mile south of the Interstate 35 split and traffic is backed up on I-35W to nearly Farm-to-Market Road 407. A wind gust is also suspected of toppling another portable building in Denton Thursday afternoon. Judy Lynn Muller shared the following photos with NBC 5 showing an overturned and flattened portable building the Academy Outdoors parking lot.